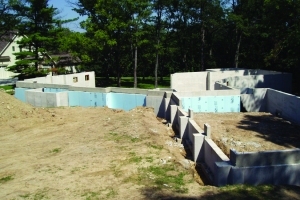 As a convenience to our customers, we offer Turnkey Packages for both poured concrete and block foundation walls. We provide everything from excavation to footers, foundation walls and all interior and exterior concrete flatwork. Have a job too complex for the average concrete company? Butch Bando Concrete, LLC is here for you! After Over 40 Years of serving the Central Ohio Area, we are able to offer the stability that quality contractors are looking for. We offer dump truck, loader and backhoe services for all of your residential and commercial projects. We offer many stamped concrete patterns and colors, flatwork, block and poured concrete foundations, cleaning, repair and sealing. Contact us for top quality products and services at affordable prices.